I'd like β, α, Δ, ≥, ≤, Ɣ, ↓, ↑, and a few others. I grepped for §, which is apparently only in one file, but even when I change that, it doesn't seem to change in the editor. And I disabled cached, closed FF, and reloaded, so fckeditor/editor/_source/internals/fckxhtmlentities.js is definitely not the right file . as a minor point, I'm using the mediawiki version, which is just absolutely killer. Glad to see Wikia has added the hooks to 1.13.
bumping myself as I suspect this didn't get many views over the weekend. Are you using the Source-enabled version of the editor? By default, the FCKeditor is run from a compiled version; updating files in _source won't effect any change unless you turn on the source version of the code. This is switched by copying out the fckeditor/editor/fckeditor.html file with the fckeditor.original.html file. Note that this can slow down performance. thanks for responding. I tried that. I cleared the cache, restarted the browser, restarted apache just to make sure, and my changes still are not showing up. I've even tried different browsers that have never seen the code before. Googling for source-enabled version of FCKeditor brought be back to this page, funny enough. Maybe a reboot? -- nope, that didn't help either. Definitely not an issue of being stuck in cache somewhere. -- I also tried using fckpackager.php to recompile, but that didn't help either. 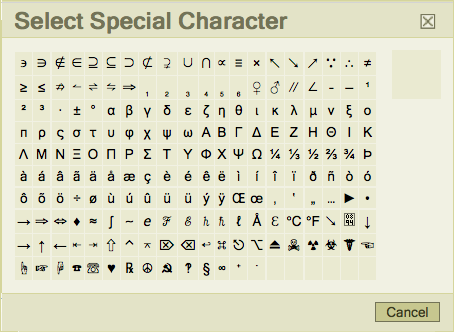 Is it pulling the special character set from somewheres else? Is it specified as unicode or utf-8? And, as it turns out, I did not have to replace the fckeditor.html with fckeditor.original.html. I would have rather attached the file, but I gave up after *.html, *.txt, and no extension were all rejected. You'll have to remove some line breaks if you want to actually use it. (If I left the line as one huge line, it seriously broke the forum's layout). I've tried adding ,"&#257;" at the end of line 85 in fck_specialchar.html where var aChars is defined as an array. Is this what you did? Okay, I take that back. It is working for me. But, it is not putting in &#257; it is putting in ā instead. Do you happen to know how I can get it to keep &#257; in there?